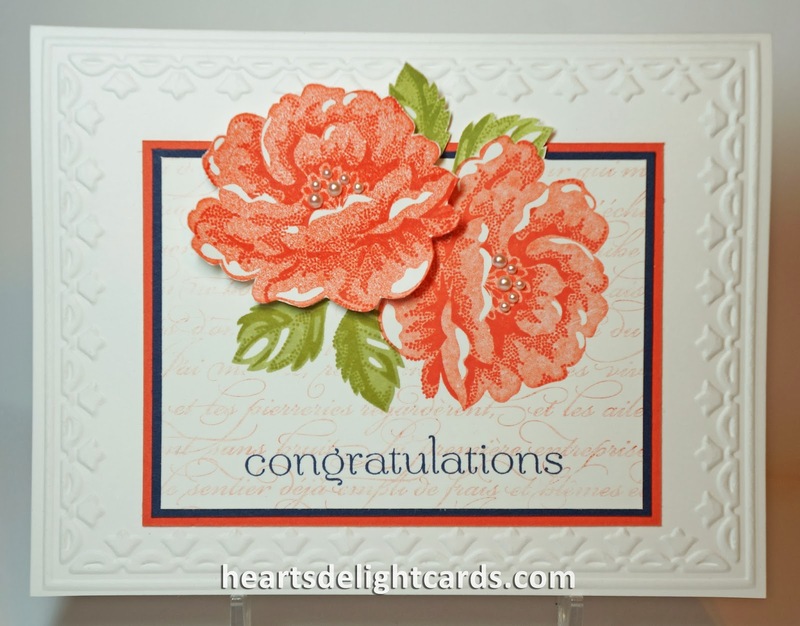 Heart's Delight Cards: Congrats Newlyweds x 2! This was such a fun card to make, and to tell the truth, I made another totally different style using the same color scheme, but forgot to snap a pic before I sealed it in the envelope. D'oh! The two cards were for my cousin's two younger daughters who got married last month in a double wedding. (They are 2/3 of a set of triplets, the other third being their brother.) Their colors were coral and navy, so I incorporated them into the cards. Anyhoo, I know it was an amazing wedding. Their father is bravely battling cancer and I wish I could have made the trip to watch him walk down the aisle with a daughter on each arm, but it wasn't possible. Well, I was there in spirit, anyway. I hope they like their congratulation cards! In the first stamping step, the blossoms were inked with Calypso Coral and stamped off once on scratch paper before stamping on the Whisper White. The second (overlay) stamp was inked with C.C. without stamping off. Same technique for the Pear Pizzazz leaves. I used a mask on the flower and leaves when I stamped the En Français (after stamping off twice). One blossom was fussy-cut and popped up on dimensionals.